All the scripting stuff is usually based on the service discovery and ad-hoc commands in the Tigase server. The first thing to do, therefore, is to browse service discovery on the running server. The result you receive will depend on your installation and installed components. The most interesting things right now are all items with "http://jabber.org/protocol/admin" in their node part. You may have a few scripts loaded already but there are two commands used for scripting management. Their names are descriptive enough: "New command script" and "Remove command script". The first is for adding a new script or updating existing and the second is for removing script from the server. To add a new script you have just to execute "New command script". 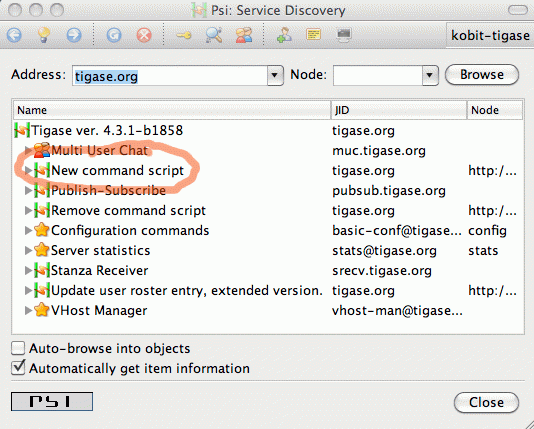 In Psi this is done by double clicking on the element in service discovery list. Description - is what shows as the script name in the service discovery window. There are no special restrictions on what to put there. Command id - is a unique ID of the script (admin command). This is what shows after the "http://jabber.org/protocol/admin" in node part. This needs to be unique or existing script is overwritten. Language - a drop down list of all supported scripting languages for your installation. 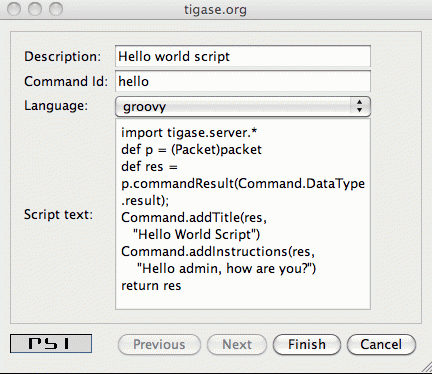 Tigase automatically detects all libraries for scripting languages and lists them here. So all you need is to select the correct language for your script. Script text - is just your script content. When your script is ready and all fields are correctly set, simply press "Finish" button and you should receive a message confirming that the script has been loaded successfully. In this guide we are creating a simple "Hello world" script written in Groovy. What it does is displays a window (ad-hoc command result) with a message: "Hello admin, how are you?". It imports basic Tigase classes. Set’s a local variable \'p' which points to a \'packet' variable with data received from the client. Creates a \'res' variable which is response sent back to the client (administrator). The response to the client is of type \'result'. Other possible types will be introduced later. We operate on ad-hoc commands here so the script uses Tigase utility class to set/retrieve command parameters. It sets the window title and a simple message displayed to the user (administrator). The last line returns new packet as a script execution result.